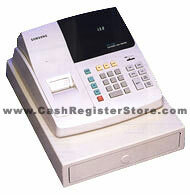 Samsung ER-150-II Electronic Cash Registers at Cash Register Store. The Samsung ER-150-II, a compact low-cost electronic cash register to meet the basic need of any small business. The Samsung ER-150-II cash register gives you a thorough review of your business with a complete analysis of your department sales, function totals and actual drawer totals to help you protect your valuable profits. Digital line printer, 2.2 lines per sec.